copados33 wrote: A bit off topic: I have an original Tokio PCB, would it be possible to convert it to Bubble Bobble? same hardware as Bubble Bobble, the western version of Tokio a.k.a. : "Scramble Formation" doesn't have the Z80, but Tokio has it. Uh, Scramble Formation and Tokio are the exact SAME game. Flipping a dip switch causes it to change the title (and place names change from english to japanese or the inverse). The board has Two Z80Bs (next to each other) one Z80A (at the opposite side as the other two Z80s) and a protection MCU (the MCU is at about the middle of the board). The sound hardware is very different (Scramble Formation/Tokio lacks the YM3526) from bubble bobble and that would be a bit of a challenge for the conversion. Is there a way to get the original bubble bobble on 11 rom set? Can anyone post a link to the original bubble bobble bootleg us version of chips 3 ,4 and 5 with 32k ? Yes on my pcb is switch 1 that changes the region although,i burn the boblbobl.zip file and get what is expected Bobble bobble bug menu and not Bubble bobble ,and stuck on 1p 2p menu when we lost,i would like the bubble bobble menu and patched 3 32k files for bb3,bb4,bb5 menu that entered in Demo mode when we lost. O level 10 i have glitches on screen when white ghosts appear ,does anyone has the same issues? 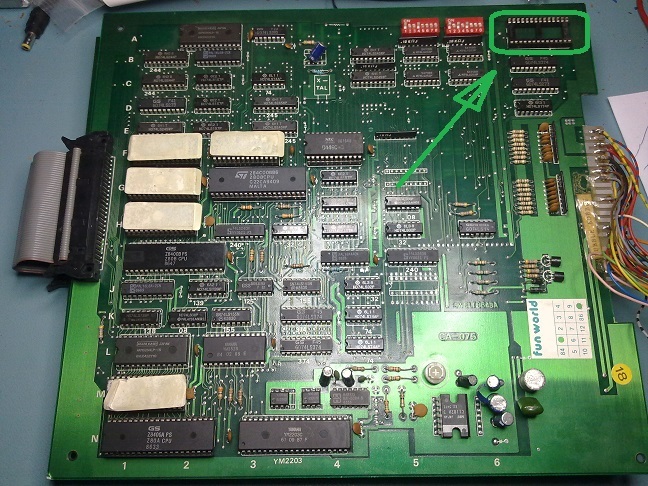 I want ask for help with this Bubble Bobble PCB. There is an ic missing in the right upper corner. What eprom should I plug in this socket ? Does someone know which binfile should be burned here ? Looks like that spot is for the protection MCU, not for a normal EPROM. A MCU ? Where can I buy this mcu for this bootleg ? KaterKarli wrote: Where can I buy this mcu for this bootleg ? If it's really a protection MCU then nowhere, I'm afraid. Even if you'd know which part it is and could get one, God knows what code would need to be inside. It wasn't that common but yes, funny enough bootleggers sometimes reprotected their cracks to keep other bootleggers from stealing the market they themselves had stolen. Definitely sick but sadly commercially meaningful. EDIT: Also, the quartz crystal is missing... I hope you didn't pay much to get this board. Regardless, it could be modified to run this redux version and I believe it removes the need of a MCU. Totally true; dumping and reprogramming those EPROMs is just too easy not to try it. The missing crystal makes me wonder though if the board might have suffered from a failed repair attempt already. At the back I allready got an 24 Mhz crystal on board . what all should be soldered in ? Got It! Don´t need this crystal. because no PS4 ic inserted. This clocks only the taito ic. That's good news. Did you turn it on already? What is the defect this board shows? as always the watchdogs (3) are reseting the board. You could start from the usual things around the CPUs: clock, reset, irq, nmi. Schematics are available around the net; be aware that the main cpu controls the reset line of the sub cpu through a latch, and then needs to communicate with it. EPROMs or RAMs could be faulty, and as Leonard already suggested you can try the latest Redux romset (after of course having dumped and verified yours). From your description I am keen on thinking that the cpu(s) either do not run at all or crash almost immediately. I hope this helps. I will check this ! I did replace the 273 latch and the main processor is doing something , I got bus activity. but after 1 second it resets the sound cpu.